FORT WORTH, Texas – KU freshmen Devon Dotson and Ochai Agbaji combined for 45 points as the No. 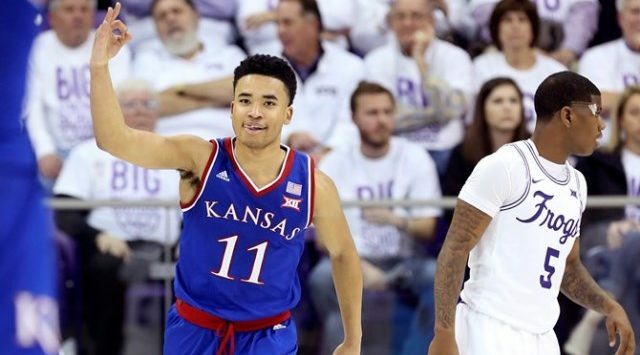 14 Kansas Jayhawks outlasted the TCU Horned Frogs, 82-77, in overtime Monday night at Schollmaier Arena. Dotson posted a game- and career-high 25 points to go along with 10 rebounds, while Agbaji also tallied a double-double via his 20 points and 11 boards. Agbaji kicked off the extra period with his second 3-pointer of the game before Dedric Lawson connected on his 13th and 14th points of the game with a turnaround jumper, putting the Jayhawks up 74-69 with 2:41 to go in OT. TCU again had an answer though, responding with a 5-0 spurt of its own to tie the score for what would be the final time on the night at 74-74 with 1:28 remaining.